The Blog of Forgotten Dreams? 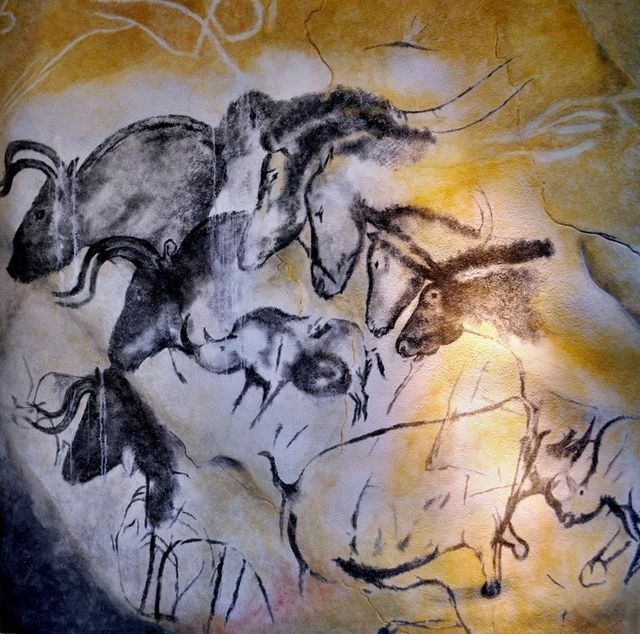 Last night, I watched Werner Herzog’s film on Chauvet Cave. It is called Cave of Forgotten Dreams, and it is an exploration of the art of a Paleolithic people, who drew amazingly lifelike depictions of the great beasts that once roamed Europe at the edge of the vast ice sheets. In true Herzogian style, it is a mixture of the scientific findings about the images of the cave and deep romantic speculation about the artists and hunters who made them. Chauvet Cave, though located in southern France was once home to hordes of megafauna, including bison, aurochs, woolly mammoths, woolly rhinoceroses, reindeer, red deer, and primitive horses. The artists also included images of European cave lions, revealing that male cave lions did not have manes, and they also included the only known image of an ancient European leopard. There was at least one image of a cave hyena, a cold-adapted relative of the modern spotted hyena, which crushed bones with its massive jaws and likely lived as a hunter-scavenger as the modern species does today. And yes, they also included images of cave bears, now extinct relatives of the brown bears that are slowly making a comeback to several countries in Europe. There is some evidence that bears were of spiritual significance to these people, for there a place in the cave where a bear skull sits atop what appears to be an altar. Many of these creatures were food and clothing for these people. Others, like lions, hyenas, and leopards, would have been enemies and competitors for the game species. Their minds must have on animals almost constantly. They were true naturalists, for their lives depended upon a detailed knowledge of zoology, ecology, and, yes, ethology. There is some debate in the literature about the exact age of images on the cave. Radiocarbon dating of the rock art, animal remains, and charcoal in the cave suggests that the most ancient images of the cave are between 30,000 and 32,000 years old. The cave was not known to modern science until 1994, and in the intervening millennia, the great beasts have gone. There are no more cave lions or cave bears or cave hyenas. Leopards and the European lion that replaced the cave lion lived in parts of southern Europe into historical times. They are also both gone. Wild horses and aurochs exist only in their domesticated forms. The Hereford and the thoroughbred descend from the fell beasts whose images grace Chauvet’s walls. Domestication has worked its ways on their kind to the point that neither creature seems like it could have come from the wild at all. The geography is vastly different. The vast sheets of ice that covered the Alps and most of what is now Germany no longer hold up the sea level. Great Britain is now an island. Temperate forest replaced the taiga and then modern humans turned that forest into cultivated fields. Villages were built, the roads, then cities, then ancient empires of Europe. Over the centuries, the wildness receded more and more. To a North American like me, most of Europe resembles a cultivated garden that is totally devoid of most raw nature. We have d deer-hunting Eastern coyotes and massive black bears. They have red foxes and badgers. The images of those long-lost people must have burned something into my psyche. When I went to bed, I dreamed of animals. I saw a white-tailed doe standing along forest path as she nursed two dappled fawns that nuzzling hard against her teats. I saw mallard hens with scores of fluffy ducklings waddling their way to the nearest pond. And I dreamed that I got a bear on my trail cam. It was not the common black bear of the East either. It was a brown bear with a shaggy brown hump and a silver mane. Never mind that no brown bear ever lived in this part of the country. Dreams are without reason or knowledge. They are mere the expression of what the mind has absorbed and wishes to express. When I awoke, it occurred to me that I am not so different from those Paleolithic hunter-artists of 30,000 years ago. My knowledge of nature does not feed me the same way it did for them, but it feeds me another way. Without nature and animals, I don’t think I could survive. My spirit just couldn’t take that deprivation. So that which feeds my spirit I pay homage to on my cave wall. But my cave is not made of limestone. Mine is of the digital age. On my blog I post the animals that I see or capture on my trail cameras. I get coyotes, two species of fox, Virginia opossums, raccoons, black bears, two species of squirrel, bobcats, and white-tailed deer. I’ve captured wild turkeys, red-tailed hawks, American crows, ravens, and turkey vultures. White-tailed deer are among the oldest extant species of ungulate. Virginia opossums don’t differ greatly from the earliest of mammals that once scurried in terror from the predatory dinosaurs. The coyotes that roam the forests here are not too dissimilar from those of the later Pleistocene or from the ancestors of the wolf-coyote-golden jackal lineage that first evolved in North America during the Blancan Stage. New casts of characters play the story of life. Extinction and extirpation vs. colonization and introduction. Predator and prey. Plant vs. herbivore. Mutation. Natural selection. Genetic drift. This is the story that was played out before we came, and it is the story that will be played out so long as living things exist on this planet. I wonder if my digital cave art will last as long as those as Chauvet Cave. A piece of me hopes so, but I know that this electronic age is a much more tenuous existence that that of the Ice Age hunters. Nuclear weapons hold the possibility of wiping us out in one fell swoop, and climate change could set off a mass extinction event that might even wind up dooming us all. A limestone cave, hidden from the wages of modernity for thousands of years, has a much better chance of surviving that a bit of digital artifact that exists only on the ether of the internet. I don’t think this will be The Blog of Forgotten Dreams. Not the least of which is that I lack the skill of the artists of Chauvet. I can barely write my own name legibly. So my art is what I type and what images I can capture on digital devices. And while I dream, I shall remember. When I go, the story of life will go on. And there I rest my hope. I’d love to visit the art caves. All of them. But Chauvet most of all. I wonder how many more Paleolithic art caves slumber on, undiscovered? There’s something both thrilling and heart-wrenching about seeing artwork created by human hands more than 300 centuries ago. This was just really beautifully written. I found this very moving. “… but it feeds me another way. Without nature and animals, I don’t think I could survive. My spirit just couldn’t take that deprivation. Pretty much that right there. Creativity at its best! Thank you for sharing an awesome piece.